If you’d like to play with our friendly, high-quality orchestra please get in touch with our secretary on jennifermoorhouse@hotmail.com or 01706 817333. 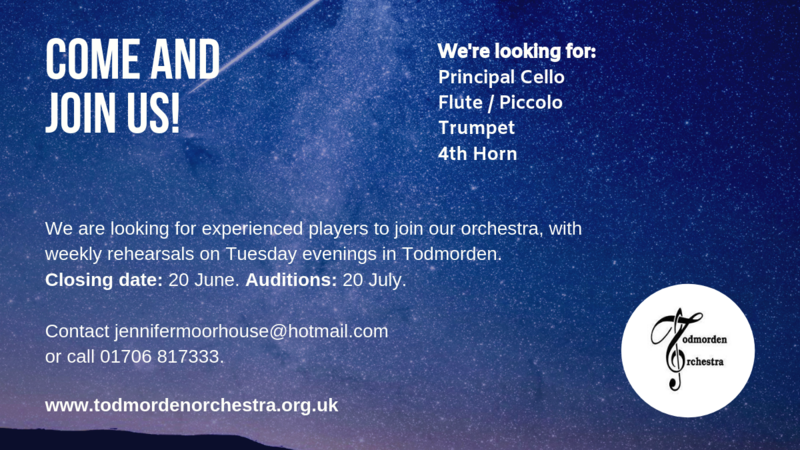 We rehearse on Tuesday evenings in central Todmorden and give 5-6 performances a year in the Grade I listed Todmorden Town Hall. The deadline for applications is 20 June 2019 and auditions will be held on 20 July 2019. Please note, we are also looking to expand our string section, particularly violins. If you are Grade 7-8 please get in touch. Auditions are not required and you’d be welcome to join us at a rehearsal.